Omnisphere is a free Windowblinds skin that has been designed for Windows 7, 8 and 10 with dark and light explorer sub-styles. 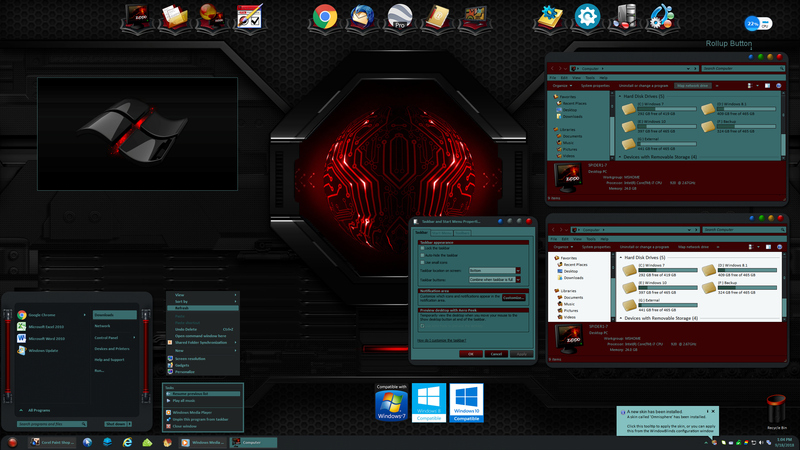 The fantastic desktop wallpapers shown are called Black and Red by IceBabee, you can get them here: Link . A roll-up button has been integrated into the skin for those who use it, and any thanks again to RedneckDude for his assistance in the testing of this skin. My sincere thanks to all for your continued support of my work. Please enjoy Omnisphere! Nice skin, Tom! Love the colors! Really good skin, Tom, love it. hola quiero saber como puedo intalarlos lo descargos pero no pasa nada me descarga un archivo en blanco¡? ?